Mabis Lumbar Cushions comes in two options to meet your needs. Select between a Full Roll Lumbar Cushion 10-3/4 x 4-3/4 inches or a Half Roll Lumbar Cushion 10-3/4 x 2-3/8 inches. The Mabis Lumbar Cushoins provide lumbar support to help ease lower back pain. Lumbar Back Cushions also promote proper spine alignment. Each Lumbar Back Cushion is made of a firm foam material and includes an elastic strap that secures it in place. 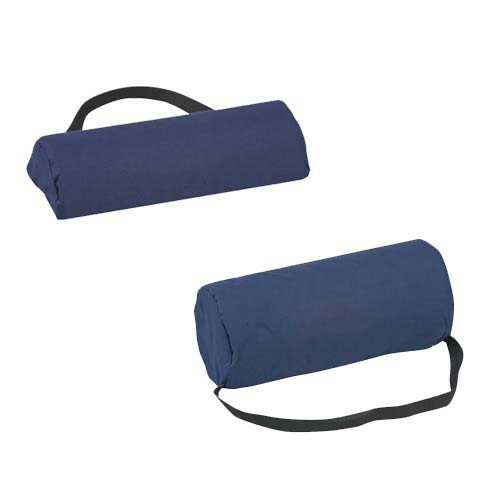 The Lumbar Back Half Roll and Lumbar Back Full Roll both come with covers that are machine washable. Full Lumbar Back Roll: 10-3/4" x 4-3/4"
Half Lumbar Back Roll: 10-3/4" x 2-3/8"
Foam meets CAL #117 requirements. 4/30 I am returning - not what I thought it would be. Please credit my account. while this is as described, it is way to small/squishy to do much good for me. May be ok for a smaller, thin person who needs just a little support, but I got it to recoop in bed from surgery.